Charron received her B.S. in Organizational Leadership from Biola University and her M.A. in Gerontology from the University of Southern California. 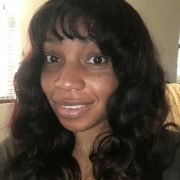 She has been with UC Davis for nearly 7 years and spent the first 3 implementing the referrals and authorization system for the health system as part of the EMR expansion in 2014, and currently manages the Regulatory Initiatives and Financial Reporting team for IT Enterprise Applications. Charron serves as a current member of the UC Davis Police Accountability Board, UC Davis Health Staff Assembly Executive Committee, Staff Advisory Committee on Equity, Diversity, and Inclusion, Status of Women at Davis Administrative Advisory Committee, and is the current Chair for the UC Davis Health African American Faculty and Staff Association. Her focus continues to be on advocating for a diverse, inclusive, and equitable faculty, staff, and student body. When she is not busy being a band mom to her teenage son, Charron enjoys writing and has published a book of poems entitled Words That Occur in the Absence of Love.